My initial travels to Australia came through boredom of work. Having worked in a large pharmaceutical company from 17, at 24 I realized that I needed to have some new adventures. I am a firm believer that if you don’t like your current situation, change it. When I was asked to go play cricket at Grade A level for the Fulham Cricket Club in Adelaide, I packed my bags and left. Actually, I got cold feet about two weeks before I was due to leave. But then a close friend was suddenly struck ill on a Friday, and sadly died two days later. That was the kick I needed. My sister is now a Canadian citizen living in Vancouver. She has been away from England for over 15 years. Can I have two? The first occurred just after I’d gotten married to my gorgeous wife on top of Grouse Mountain in Vancouver. After the wedding, she had to go back to her job in California, while I continued waiting in Vancouver for my visa to be approved. In those three months of waiting, the uncertainty of not knowing if I would be allowed to join her made for very stressful times. We could simply have flown back to England, where a job was being held for me in the City. That would have been so easy, but that said, we have never chosen the easy option. The other time occurred much earlier: May 24th, 1997. A very precise date, but I remember it so well. I was on the road from Melbourne to Sydney, all on my own, on my birthday, and not one person said “Happy Birthday” or even knew it was my special day. I’d have to say right now. We moved to my wife’s homeland two years ago. The culture shock, combined my lack of language skills, was daunting at first. The people, especially her family, have been incredible, but finding a life was very tough. Since we moved here, we have both found jobs in the same company; had our first child, the adorable Matej; and are about two months away from moving into the cottage we are renovating in the village next door to Plavé Vozokany (we’ve been living here with my wife’s parents since our arrival). So, right now, I am on the verge of having all I have ever wanted. To settle into a new country takes time, a lot of time, especially one that is so different to your homeland. I still have some time to go, but with the growing family, a supportive wife, a good job, and soon my dream house, I am ticking all the right boxes. You may bring one curiosity you’ve collected from each of the countries where you’ve lived into the Displaced Nation. What’s in your suitcase? From England: My St George’s flag — not because I wish to be associated with rowdy football supporters but because it’s a symbol of my country that I’m very proud of. From Australia: My Ugg boots from the open-air market in Port Adelaide. I have them on right now! From Slovakia: A bottle of homemade Slivovica, a plum brandy strong enough to blow your socks off! Whoa, that’s tough… But let me try. To start, we’d have fresh prawns and seafood from Australia. As my main, I’d offer my Mum’s Christmas dinner: turkey, sausages and bacon, Brussels sprouts, veggies galore, roast potatoes, cranberries, stuffing… And if there’s still room, I’d throw in some sushi from Masa Sushi, a tiny, simple, dirty-looking place off 19th Street and Habour in Costa Mesa, California — the host/chef really knows what he’s doing. For dessert, we’d have fresh, homemade cream cakes from my mother-in-law here in Slovakia. It would all be washed down with an Australian white, a pint of Coopers (Southern Australian beer), and a couple of shots of Slivovica. From Australia: Beauty (said in a heavy Aussie accent). It’s used all the time — but most especially on the cricket fields, after a player hits a good shot or the bowler gets a wicket. From California: Awesome — but I’d advise that you restrict the usage to things that are truly awesome; otherwise, it loses its meaning. That pair of shoes is AWESOME; that TV show is AWESOME; You are AWESOME — no! The Grand Canyon is awesome — yes! It’s Pocahontas month at The Displaced Nation, and we’re focusing on cross-cultural communications (or the lack). By living in your wife’s country, do you find that you’re relying on her to serve as your “interpreter” for Slovakian language and culture? Does this place a special stress on the marriage, and if so, how do the two of you cope with it? Yes, it definitely does. When you go away on holiday and do, say, exploratory grocery shopping, it’s all a bit of fun trying to cope, but when you actually move to the country it’s totally different. So many things to sort out: banks, mortgages, identity cards, driving license — the list is endless. And she has to do all of this. Even if I have to make a trip to the doctor’s, she has to come. When you are sitting there having two people discuss your health, and you cannot understand what they’re saying, it’s very stressful. As I mentioned earlier, we are renovating an old Slovak cottage. But to communicate with all the different workers and tradesmen, again, she has to do it all… You can imagine what a workload she carries for this project, and the uselessness I feel in not being able to help her. Our relationship, like so many others, works because one of us takes the lead, and in our case, that happens to be her. Imagine Monica Geller from Friends — well, that is my wife. She likes to be in control. Even when we were living in America, she was in charge. So for us, with some blips, it does work. But whenever I want to do things — relieve her of some of her workload and stress — it’s a struggle. My Slovak is improving, but it is not good enough to cope with these kinds of demands. It’s a very tough language, and at 40, I am a poor student. STAY TUNED for tomorrow’s installment from our displaced fictional heroine, Libby, who encounters her very first 4th of July celebrations. I wondered why you were holding a pigs leg! 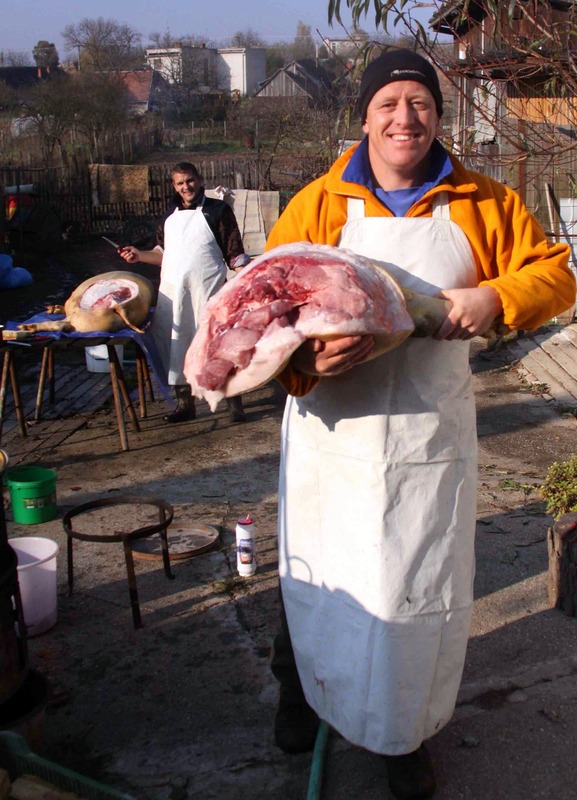 Def a Yay from me for having to the courage to join in traditional slaughter of pigs that occurs in your Slovakian village every year. It’s a way of life here, you raise your pigs, you slaughter them, you eat them …. Piglet, I’m curious about your “yay” vote as I know from your own Random Nomad interview that you’ve always wanted a pet pig! As I recall, we gave you a hard time about that — how you could reconcile wanting a pig as a pet (and loving them as other people love dogs) and eating Portuguese pork dishes. And now you seem to be condoning ritual slaughter? Is that because it’s in Slovakia? Making the pork scratchings was one of my first jobs !!!!!…. I will bring some along ! Okay, someone pls enlighten me. What are pork scratchings, pray tell? What an interesting Random Nomad you are. I would love to take my Englishman to Finland and may yet do that…your story has inspired me. But what about the problem of having to translate everything for him? Pls see Simon’s answer to the Pocahontas question! As winter approached the settlers had nothing to eat. They would eat whatever they could find; dogs, snakes, cats, toadstools, and horsehides. The recipe, as it were, for survival was to trade with, and get advice from, the natives. An Englishman moving to Slovakia, that’s random indeed. And very brave! I sometimes joke that it’s a good thing that the Slovak language is not one of the most spoken languages in the world that one is forced to learn. Simon, I don’t know how you do it but maybe a few shots of slivovica help! And yes, some people still rise and slaughter pigs in Slovakia, also other animals such as rabbits, chickens, ducks etc. Gardening is also very popular in the villages where most people own a house with a big garden. Yay from me, for sure! Simon is a truly intrepid person, willing to take on challenges most of us would baulk at, and do it cheerfully. He may be displaced, but I’d bet my last green pound note that he always makes the best of what he’s dealt – and enjoys it! Well, most of the time!